Bocoe and Decoe with Dr. Eggman from Sonic X.
Decoe and Bocoe are Dr. Eggman's hench-bots in the anime Sonic X. Decoe is voiced by Ken Yamaguchi in Japanese and by Andrew Rannells, who also voices Bokkun, in English, and Bocoe is voiced by Bin Shimada in Japanese and by Darren Dunstan, who also voices Mr. Tanaka, in English. Decoe is a tall, thin gold robot and often the brains behind the two, making him similar to Scratch from Adventures of Sonic the Hedgehog. Bocoe is a short, fat silver robot who often carries out the plans, which makes him similar to Grounder from the same cartoon. 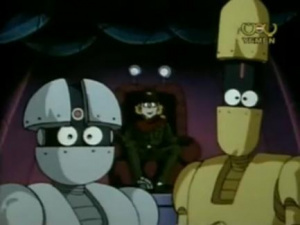 The two debuted as nameless robots in the episode Enter the Supersonic Hero!, but Bocoe didn't talk. Decoe had put up the defenses, and when Sonic caused Chaos Control, the robots were teleported (along with everyone else) to Station Square. They made minor appearances until the episodes Before the Attack on Eggman's Base and After the Attack on Eggman's Base when Decoe and Bocoe launched robots to attack G.U.N. They also attacked Eggman by mistake. Eventually, Chris Thorndyke saved their life in the episode Sonic VS Monster from the Underground and they temporarily joined Sonic's side. Unlike most of Doctor Eggman's robots in Sonic X, Docoe and Bocoe display little aptitude in combat. 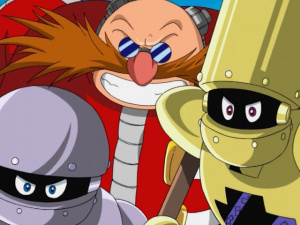 However, they do seem to have a considerable role in overseeing the progress of Eggman's plans and are almost never far from the doctor or his latest center of command. In two episodes, Before the Attack on Eggman's Base and After the Attack on Eggman's Base, the two are even put in charge of defending Eggman's island base from the encroaching G.U.N. forces in the doctor's absence. Docoe and Bocoe can also combine together as one functional unit, though this serves little purpose than to project a spotlight to summon Bokkun. Like many other of Eggman's robots, Decoe and Bocoe aren't very smart. However, they are nice and actually have feelings: for instance, at one point, they were seen crying. Throughout episodes 1 to 52 in both the original Japanese version and the English dub, Decoe and Bocoe often make snide comments at Eggman's expense, quipping within earshot about everything from the Doctor's rash decisions to his excessive weight. Omega and Epsilon, from the anime Rescue Kids. The 1991 anime 緊急発進セイバーキッズ was produced by the same studio as Sonic X, Tokyo Movie Shinsha. The show featured two robots called Omega and Epsilon, with designs closely resembling Decoe and Bocoe's. First mention of Omega and Epsilon on the scene. This page was last edited on 8 April 2018, at 07:55.